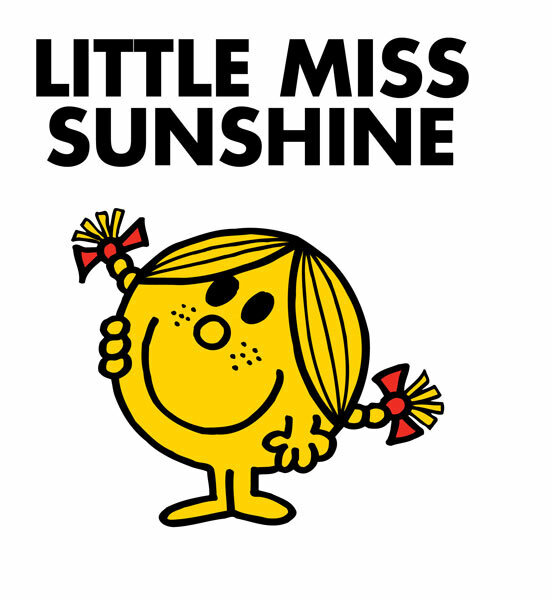 It’s the last day of August and my oldest daughter has been back to school since Wednesday. Somehow, it just doesn’t seem “right” to be going back to school when it’s still August! August is a designated Summer month. And school and Summer shouldn’t really intersect in my opinion! None the less, it is what it is and we are very much attempting to get back into some semblance of a routine. Getting my oldest daughter to the bus on time, my youngest to daycare and (starting on the 4th) myself to school in the morning is a challenge. I’ve discussed how I deal with keeping my family on schedule as stress-free as possible before. 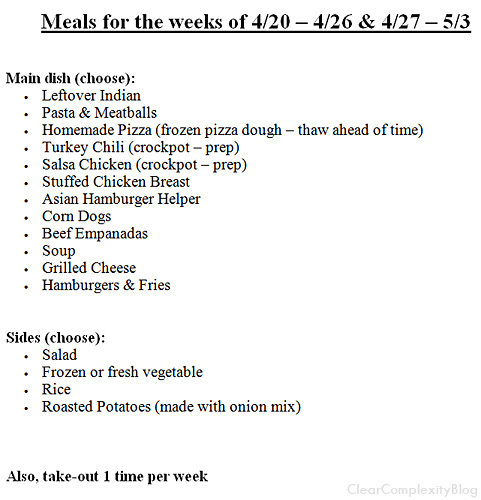 I continue to schedule everything, prep the night before and meal plan. As my children have gotten older I’ve included them more in my routine making. This school year I gave them both checklists for their morning and evening routines. I found some magnetic dry erase boards in the dollar section of Target (LOVE Target) and modified them by putting the markers on attached strings, so they wouldn’t get lost. 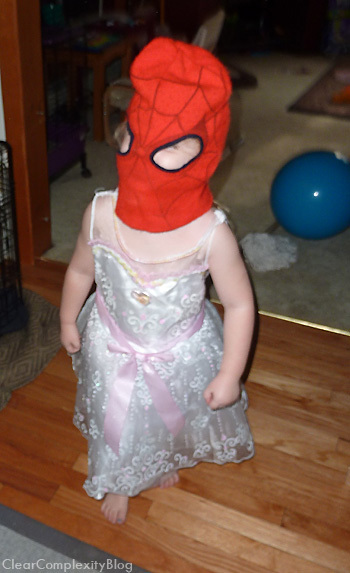 I had each child help me come up with their list of tasks, which we separated into morning and evening. Since they take medicine in the morning and evening, we put that task in the middle so it only had to be written down once. By the way… the checklist on the right… the task in the middle is “take your medicine”. I know. It’s really hard to decipher and I’m not so good at drawing a medicine spoon or bottle. For my oldest daughter, Z, (8 years old) I wrote out her tasks. For my youngest daughter, E, (4 years old) I drew pictures to represent her tasks since she cannot yet read and I wanted both my children to independently be able to read and complete their tasks. 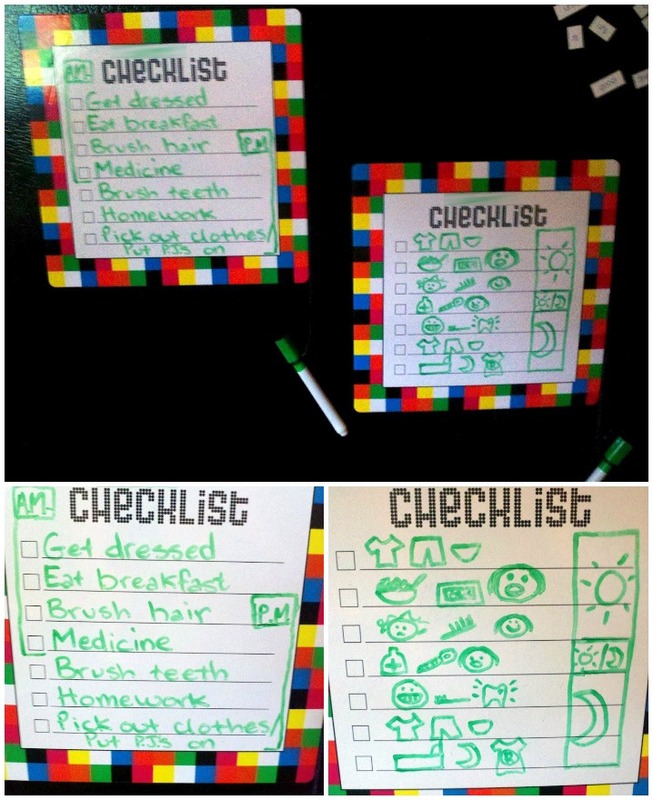 Their checklists are hung on the side of our refrigerator (a central area in our house) at their height levels so they are easily assessable to them. Being able to check off a completed task honestly feels pretty awesome and it helps guide them in what they need to get done without me having to constantly tell them. Instead, they can look at their checklist and see what needs to be completed. If they get distracted (which happens with children, especially those with ADHD) I can redirect them by reminding them that they need to look to see what needs to be checked off. So far, this has worked quite well and has given them some responsibility over their morning and evening routines. It also doubles as a reminder to me what they need to be doing! Of course, I decided to run with the checklist idea and made myself one as well. My checklist is hung on the opposite side of the fridge and is something I see every time I walk into the kitchen. 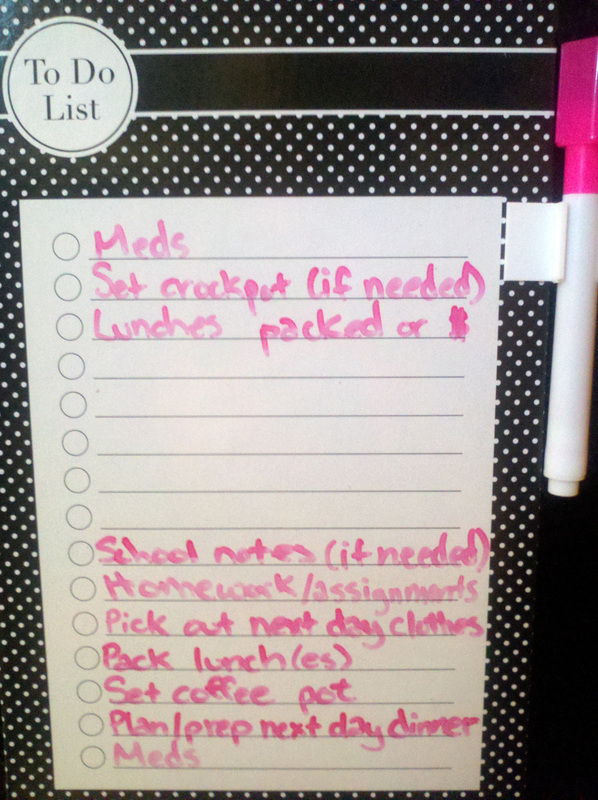 Having tasks written down really helps keep me organized. Instead of feeling overwhelmed with all that needs to be done, I can clearly see my tasks and focus on completing them rather than figuring out what they are. Also, checking off tasks really does feel AH-MAZING! This is only the beginning. Of my organization, planning, scheduling and routines. Of the school year. Of the rest of my life. So if this morning doesn’t go well, I can take a deep breath and realize I can try to have it go better tomorrow. This entry was posted in Being a Mom, Resources, Skills and tagged children, daughter(s), family, keep it simple, knowledge, parenting, responsiblity, school, stress, support, tools on August 31, 2012 by Lyndsey. The act of avoiding something or distracting yourself from something can be very useful in tolerating painful events or emotions when you can’t make things better immediately. This can be a subconscious action but often works best when consciously decided. When we’re feeling distressed, distracting ourselves with other activities, thoughts, emotions and sensations can allow our focus to shift from a negative, stressful place to a place that feels more tolerable. 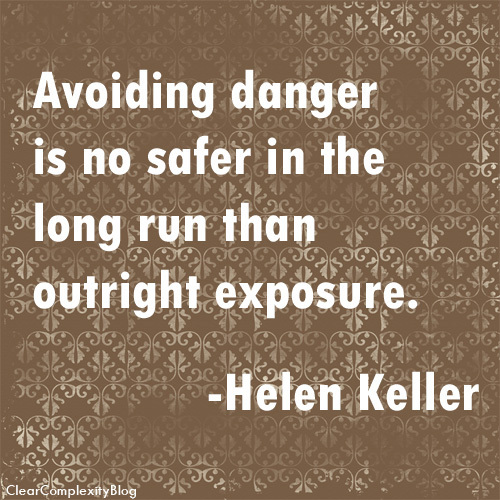 The same can be said for avoiding distressing events, people, tasks, etc. However, if we constantly avoid and distract ourselves from things that cause us distress, we inadvertently give those things more power and allow them to appear bigger, scarier and more stressful than they may really be (see On Vulnerability). This can also lead to unintentional inattention in other areas of our lives (see Procrastination). Temporary use of avoidance and distraction as coping skills works well, but they shouldn’t become a “way of life”. If we constantly avoid and distract ourselves from things that cause us distress, we never allow ourselves the ability to work through them and, hopefully, overcome them. We also might be missing out on some very pleasant experiences that just happen to accidentally get overlooked. I’m not saying to be reckless. Or put yourself in the way of obvious danger. But if you constantly distract yourself from feeling negative emotions or experiencing potentially distressing events, you’re doing yourself a disfavor. In order to ever truly live fully, we must at some point face the things that distress us. I know you don’t want to hear that. I don’t want to either. I’d much rather go on believing that if I avoid it, if I distract myself from it, if I pretend that it doesn’t exist that it cannot effect me. Just thinking about it, I can feel a knot in my stomach forming. A sickish, uncomfortable feeling. It’s much easier to avoid or distract myself from thinking about it. The sickish feeling goes away. I can breathe easier and go about my day. Until the distressful thing comes up again. Someone mentions it. My mind wanders to it. I’m confronted with it face to face. Now, the sickish feeling is worse. The know in my stomach has grown. I can keep avoiding it seemingly forever, distracting myself to better tolerate the feelings. But it still exists. And it will keep popping up, often at horrible times, the sickish feeling constantly growing. Avoiding something makes it easier to tolerate, but it doesn’t make the distress go away. At some point you need to face the thing(s) that causes you distress. When you choose to do so is your choice. So is how. And how much. But as long as you avoid it and distract yourself from it, it’s still there. And it will still cause you distress. This entry was posted in Resources, Skills and tagged acceptance, avoidance, choice, coping skills, distraction, distressing events, knowledge, mental health, self-growth, stress, tools on March 7, 2012 by Lyndsey. That’s all we have. That’s all we ever had and will ever have. Good moments. Bad moments. Moments that seems so insignificant at the time that later down the line we find ourselves replaying in our minds. Moments that make us feel something. Anything. That let us feel alive, if only in that very moment. We’re all kidding ourselves to think otherwise. It truly isn’t about the grand picture, the sum of it all. It’s about the very little tiny times, scattered amongst the sea of monotony and sameness. We don’t ever remember the majority of our lives. All the times spent sleeping or driving or working. We don’t keep those. We don’t keep the moments of repetition or status quo either. And as quickly as we have them, as soon as we acknowledge their presence and grasp them with both hands, they slip away just as fast. All we have is moments. 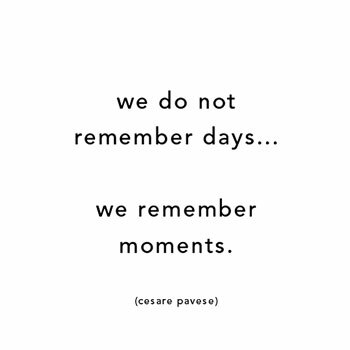 I know I keep writing about moments and being mindful, but it’s because its important! And honestly, it’s easy to forget. Building on yesterday’s post, The Myth of the Perfect Holiday, I want to continue to focus on slowing down and being mindful. Mindfulness (or being present in the moment) is being aware without judgement — of life as it is, of yourself as you are and of other people as they are — in the present moment, here and now. Whatever your attention is on, that’s what life is for you at any given moment. Focus on the negatives in your life and that’s what your life is for you. Focus on worries, that’s what your life is. Focus on gratitude and positives and, you guessed it, that’s what your life is for you. Take just a few seconds to recall a moment you have really valued. Maybe it was a special time with a loved one. Or an experience you had in nature. Perhaps it was time spent with a child or a pet. Or a time you reached an accomplishment or supported a friend in need. Think about this time (write it down if you wish) and take the opportunity to focus on what really matters. It’s so easy to get lost in life, swept up in the rush of emotions and movements. 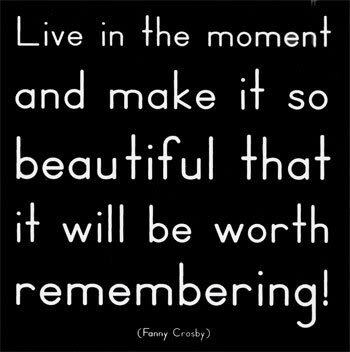 Take the time to be in the moment, whatever it might be, because it’s really all we have. This entry was posted in Resources, Skills and tagged choice, DBT, knowledge, mental health, mindfulness, perpective change, self-growth, stress, support, the little things, tools, worry on December 22, 2011 by Lyndsey. Life has a way of building up, of stacking situations, events, emotions, needs and tasks on top of each other. Until it gets difficult to clearly see what is a priority and what is really important. The holidays are especially a time like that. Making sure presents are gotten and wrapped. That the decorations go up. That the tree goes up and gets decorated. That you can find where the menorah is. (We celebrate Christmas, Hanukkah and Winter Solstice). There’s excitement in the air and the kids can’t contain it (often the adults can’t either). There’s traveling or guests coming to your house. Is your house clean? I better put away the empty bottles from the kitchen. And dust everything. And did I vacuum the floor in the basement where no one will go and that no one will see? Sometimes we get so wrapped up in all the things we need to do and all the details that we fail to pay attention to the “other” things. Like driving. I’m not certain why, but once it hits the week before the holidays it seems that many people forget how to drive. Blinkers? I know where I’m going! Stop signs and speed limits? I need to get there 10 minutes ago. And the inattention continues in the stores. People rushing and carelessly bumping into others. Failing to hold the door for the person behind you. Huffing at the long lines at the check out. Even fighting over the last of an item. How is this beneficial to anyone? We’re all stressed out. Rushed. Anxious. Everyone would like to have the “perfect” holiday. The perfectly decorated house. The perfect holiday meal. The perfect gifts, for loved ones and ourselves. But not at the expense of others and ourselves. How about some goodwill towards others? Hold the door for the person behind you. Donate to those less fortunate, with monetary donations, donations of a gift or food, or volunteering your time. Say thank you to those helping you at the stores. Retail is brutal this time of year (and year round!) and a simple gesture such as thank you goes a long way. Even if your house isn’t perfect. Or your meal doesn’t turn out as planned. Or the presents you give/receive aren’t exactly what was wanted. Be grateful of what you do have. 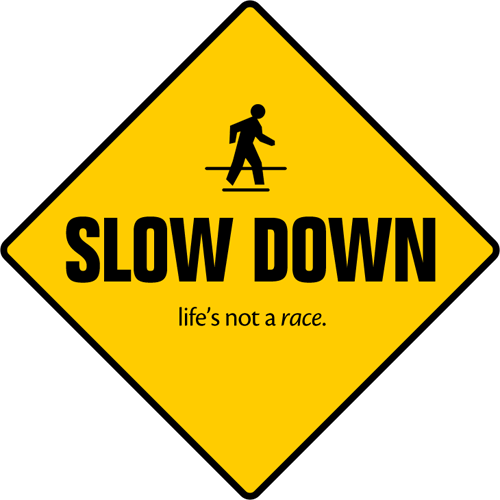 And slow down. Be kind to those around you in your daily travels. Be thankful of the food you consume. Be present in the moment and enjoy the time you’ve been blessed to spend with those you love. It isn’t about the food. Or the presents. Or the decorations. Or what you receive. Or what you didn’t receive. So slow down, take a deep breath and just be here. Wishing you all happy holidays, whatever you choose to celebrate. This entry was posted in Keep It Simple, Resources, Skills and tagged appreciation, choice, DBT, gratitude, just breathe, keep it simple, mindfulness, priorities, stress on December 21, 2011 by Lyndsey. Holidays can be a difficult time. There’s the stress of planning, of cooking a meal, of traveling to destinations. There’s the stress of family. Of gathering everyone together. Of relationships that may be less than ideal. And the feeling of absence of loved ones, either through distance or death. It’s now been over a year since my father has passed away. This past Halloween was the second year without him and tomorrow will be the second Thanksgiving. People have told me that it will, “get easier” but so far that hasn’t been my experience. I find each holiday, each event and milestone to be equally as difficult as the last. There’s a constant feeling of, “he should be here.” This past June as I sat at my graduation, waiting to walk for my Early Childhood degree, I had difficulty containing my tears and my emotions. I kept trying to focus on the speakers, on those sitting around me, on the number of seats in the venue… on anything to distract myself from the running thought in my head that he should be here. Because he should have been there. While I was proud of my accomplishments, my feelings of loss were overwhelming. My feelings of loss exist outside of holidays and milestones. Perhaps this is just another stage of grief. Or perhaps this is a lasting feeling. I mean, I miss my dad and it follows logic that I would feel that loss even more so in times of heightened significance. Holidays. Birthdays. Graduations. People that play such a vital, important role in our lives surely would be missed. Surely their absence wouldn’t be overlooked. I don’t want to dwell on the sadness of his absence. I don’t want to allow my feelings of sadness to become a surrogate replacement for the place where, “he should be”. So how can I, and others dealing with loss, handle the upcoming holidays (and other milestones) ? Holidays often magnify feelings of loss of a loved one. It is important and natural to experience the sadness that comes. To block such feelings is unhealthy. Keep the positive memory of the loved one alive. Often after the first year the people in your life may expect you to be over it. We are never over it but the experience of many bereaved is that eventually they enjoy the holidays again. 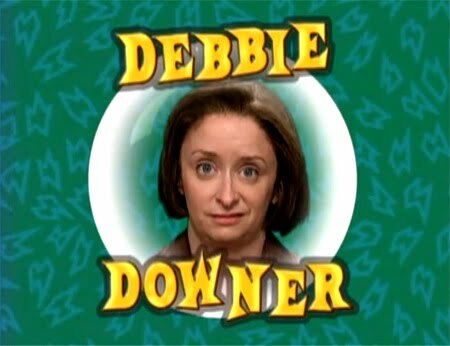 Don’t forget, anticipation of any holiday is so much worse than the actual holiday. 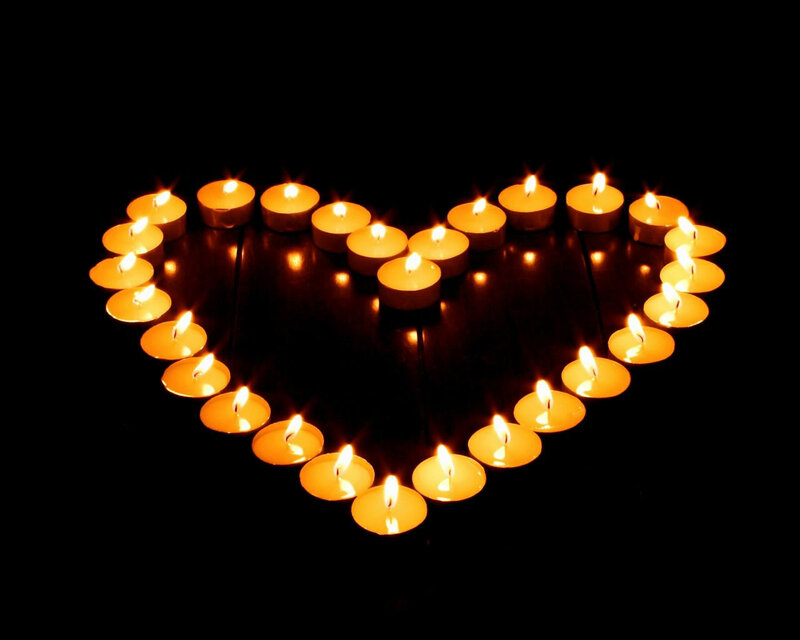 Light a candle to honor your loved one, perhaps during holiday gatherings as a reminder of them. Create a memory box by asking family members and friends to write down a good memory they have of your loved one. These may be shared as a group or viewed at a later point privately. Look at pictures and/or videos of your loved one. Often times these will spark memories and encourage conversation of good times. At a gathering, encourage family and friends to make colleges of words and images that remind them of your loved one from old magazines, scissors and glue. Overall, be gentle with yourself. There is no magic amount of time designated for grieving. There’s also no “right” way you should be feeling. Do what feels comfortable to you and allow yourself to feel however it is you feel. This entry was posted in Resources, Skills and tagged family, grief, holidays, just breathe, knowledge, mindfulness, stress, support, tools on November 23, 2011 by Lyndsey.